"It is an ungrateful business to disturb Ukrainians at New Year's and Christmas holidays." 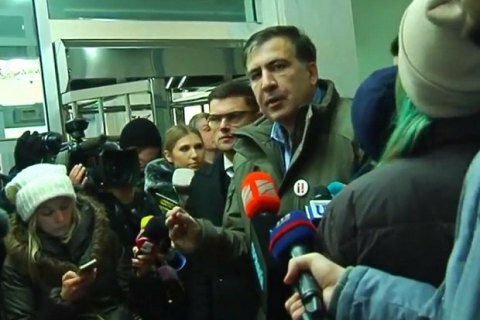 The leader of the Movement of New Forces Mikheil Saakashvili declared a break in mass protests for the New Year holidays. "It is an ungrateful business to disturb Ukrainians at New Year's and Christmas holidays. That's all there is to it," Saakashvili told journalists in the Court of Appeal of Kyiv that will consider a complaint against the arrest of Saakashvili's ally Severion Dangadze. Saakashvili complained that every march of his supporters was accompanied by provocations, the latter nearly ended with the seizure of the October Palace near the Independence Square. "We need to work out a clear mechanism safeguarding against provocations when we organise these marches," he said. Saakashvili's supporters since October 17 on Sundays have been holding mass anti-government rallies. During the march on 10 December, up to 10 thousand people hit the streets of Kyiv. A less massive march on 17 December ended up in clashes with the police and the National Guard during an attempted seizure of the October Palace concert hall in downtown Kyiv. Saakashvili has stated plans to place his "headquarters" without a previous agreement with the venue's administration. His supporters tried to seize the building by force but were defeated by the National Guards.